Chances are you know about the clear rock crystal. Here are other types and forms. MOST OF THE QUARTZ in the Ouachita Mountains occurs as milky veins. The principal difference between milky quartz and clear rock crystal is the presence of innumerable microscopic bubbles or fluid-filled cavities in the milky quartz. These cavities scatter the light that otherwise would pass through a clear crystal. In this article, crystal form refers not to the strict crystallography definition, but instead to growth patterns of groups of crystals. Smoky quartz occurs next to Cretaceous igneous rocks near Magnet Cove in Hot Spring county. The dark color is caused by radioactivity that irradiated the crystal during, or shortly after, its formation. Growth zoning is common in crystals from this area. 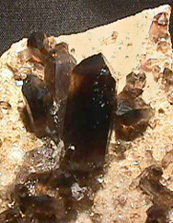 Some natural smoky quartz has also been found in Garland County, although *most* smoky quartz present in rock shops is natural quartz that has been artificially irradiated. Quartz with fluid inclusions ("bubble quartz") and negative or skeletal crystals are present in the younger formations (Stanley and Atoka) of the Ouachita Mountains. Usually, these types of crystals resemble quartz from Herkimer, New York, and are formed in calcite veins which commonly weather away, leaving the crystals suspended in clay. Coontail quartz is a local name for a particular variety of smoky quartz collected at several sites adjacent to Magnet Cove. There are alternating zones of black and milky quartz. See more at Ask Mikey. Distorted double terminated growth forms called "cubic" quartz by old time collectors. It has very small to non-existent prism faces. Webster defines asterism as an optical phenomenon of some crystals that exhibit a star-shaped body produced by reflected light or by transmitted light and gives star sapphire and mica as examples. You may be familiar with some of the well-known gems, such as ruby and sapphire, that produce 6-rayed stars when cut as cabochons. They are both a form of corundum, a mineral that crystallizes in the Hexagonal crystal system. They owe their star-producing property to microscopic inclusions of other minerals that are oriented parallel to the 3 a crystallographic axes. These inclusions appear to have exsolved from the mineral as it cooled down after crystal growth. The process of exsolution occurs because at high temperature the mineral's lattice structure is capable of allowing various elements to be incorporated, but after the mineral formed and while it cools, the lattice structure forces these materials out of the structure. So exsolution is responsible for producing the oriented nature of the included mineral. Now, asterism is not very common in most varieties of quartz, but is sometimes seen in rose quartz. Rose quartz deposits are most often associated with granite intrusions and tend to have formed in pegmatite bodies at higher temperatures than vein quartz. Rose quartz typically has oriented needle-like inclusions of rutile, the mineral having formed by the process of exsolution. Spheres cut from rose quartz containing exsolved rutile may show marked asterism. Looking directly down the c crystallographic axis one will see the strongest set of rays. Asterism is best observed by using a single point light source, like an incandescent bulb or the sun. Under this type of lighting, rotate the sphere around to see if it produces a star (rotating allows you to find the proper orientation). For a clear mineral, like in the photo of the rose quartz sphere, placing a mirror directly underneath the specimen results in a strong star that appears to hover slightly above the sphere! In quartz the scattering of light along the oriented rutile needles causes asterism. The smaller the rutile needles the sharper the star effect. Rutile needles in rose quartz usually are 0.01 to 0.02 micron in thickness and may range from a fraction of a millimeter to over a centimeter in length. 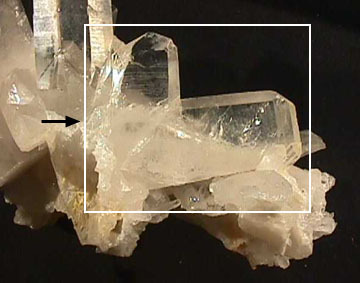 If the needles are visible to the eye as inclusions, the quartz is milky with a low translucency and lacks asterism. Multiple terminated growth on a growth form called "cactus quartz" by local collectors, Big Cedar Bluff, Perry County, AR. The growth in the C axis direction is so rapid that the trigonal termination faces are not filled in on the crystal aggregates to form a "single" crystal. Tiny trigonal faces terminate each termination, all in the same orientation. Growth of subparallel individual crystals produces a curved crystal specimen, Jeffery quarry, North Little Rock, Pulaski County, AR. All the individual crystals in this specimen are straight, but the overall effect of offset growth is a curved appearance. Below. Rehealing of a "splinter" fragment derived by natural breakage of a large quartz crystal by earth movement. Specimen from Ron Coleman mine, Jessieville, Garland County, AR. Notice the rainbow colors. Faulted crystals are a little different than fractured crystals. Many crystals get fractured and reheal so the fracturing does not reach the surface of the crystal. This is one way "rainbow" reflections are generated, see the above photo. Faulting of a crystal actually offsets the two or more pieces, therefore the two parts might still be adhering to each other due to later growth, like in the photo on the left, or might be recovered as two separate partial crystals, sometimes with regrowth on the broken portion of each piece. In most parallel tabular growth specimens, careful examination will reveal that there was a single string or "faden" crystal that the parallel growth oriented on as it began to form. The parallel tabular crystals have their C axes at some angle, not parallel, to the C axis of the string crystal. These strings, in the few attached Arkansas vein examples I have seen, are typically at close to right angle to the sheet-like form of the vein. In the two Jeffrey specimens pictured above, it appears that the string had broken loose and was suspended in rectorite before the parallel crystal growth was initated. This condition of breakage seems necessary for the formation of true floater specimens in Arkansas. Otherwise there would be a point of attachment on the piece. Above. This single japanese twin is from Fisher Mountain near Mt. Ida. This japanese twin on a cluster is from Burrough's Collier Creek mine near Mount Ida. Japanese twins have been scarce, but recovered from certain deposits in the Mount Ida area for the past 100 years. Only recently, have I heard from Ron Coleman of the discovery of a few Japanese twins from his mine near Jessieville. In 1996, while unpacking some recently mined specimens at the Tucson show, Ron came across a single Japanese twin. He recognized the specimen as one of the last ones dug, cleaned and packed to go to Arizona. So he separated it out, packed it back up, and shipped it back home. After he returned home from the show, he went into the mine and located the specific vein that specimen came from. Surprize! There was another Japanese twin just hanging on the vein wall, waiting for him to collect. Since then he had recovered several additional twins from that one vein. Phantom quartz is caused by temporary interruption(s) of the crystal's growth process. Small bubbles, or small settling particles of shale or fine-grained minerals, adhere to the crystal faces of the growing quartz, resulting in 'phantoms' that look like a crystal grown inside of another crystal. Black shale tip phantom from Montgomery County; Chlorite phantom, Garland County; mud inclusion in negative smoky crystal (pseudo-phantom), near Glenwood, Montgomery County; double terminated double black shale phantom - Collier Creek mine, Montgomery County. Phantom quartz has the characteristic of displaying some of the past growth history of a given crystal, due to either the deposition of some mineral matter on faces during deposition or due a change in the conditions of growth, such as stoppage or interruption of the growth. Phantoms are relatively common in smoky or amethyst quartz worldwide and are seen as growth zoning, displayed as variable color shades -- alternating light and dark zones, particularly when looking in the dominant face on the termination (the dominant trigonal pyramid face). Examples of phantoms from Arkansas include those that contain various mineral matter, such as the so-called blue phantoms which enclose fine-grained black shale particles, and white cap phantoms which have a termination of white milky quartz covered by clear rock crystal. In the instance of blue phantoms, many specimens will consist of multiple phantomed crystals. Most often blue phantoms do not exhibit a complete crystal internally. A third example of included minerals include green chamosite (an iron-rich variety of chlorite called thuringite). Specimens of green phantoms most often are recovered from veins adjacent to shale, having extracted the chemical components necessary for the formation of this mineral from the shale host. These crystals may appear as cloudy uniformly pastel green phantoms with clear quartz coatings or as granular zones on 2 or 3 faces. Many of these types of phantoms only display a few faces with the phantom appearance. This is because the included mineral material was being washed through the vein by the mineralizing fluid as fine-grained suspended particles. The back or eddy side of the crystals is where this material could settle out of the fluid onto the crystal. When you view a specimen consisting of many phantoms of this type, often all the crystals that extend directly from the cavity wall have the same orientation. When this is true, you can determine the direction of flow of the mineralizing fluid. Terminal crystal faces grow more rapidly and become dominant that "face" the flow; those that are on the "backwater" in the eddies cannot grow as rapidly and become smaller relative to the others. Even many clusters of rock crystal display this same characteristic. The other major type of phantoms often seen from Arkansas deposits are due to changes in the chemistry of the fluids or interruption of the growth cycle. Those that form a complete phantom termination fall into this category. They may be white-capped, pale "ghost-like" caps or even dissolved-appearing stubs preserved in well terminated rock crystal. Any change of the fluid's composition or stoppage of the fluid flow may result in a change in the rate of deposition of the crystal. To the left are crystals from a pocket at the Collier Creek mine in Montgomery County. 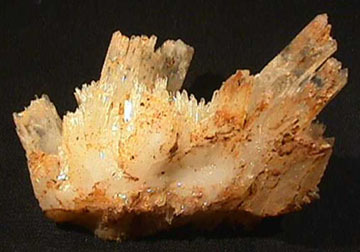 Note the stub-type termination about half way down the length of the crystals. In fact, some of the crystal may dissolve away. Tiny bubbles of gas or particles of shale may be trapped on crystals, particularly terminations, when a dry pocket again becomes fluid-filled. This can be preserved by the start up of rapid growth of clear crystal. The crystal in this photograph shows a combination of the stub-type interrupted growth and a termination phantom cap! These crystals may have gotten broken in the pocket and partly rehealed before major growth started again or may have had the termination dissolved away before regrowth. This closeup picture, left, displays what I consider to be solution features on the trigonal (termination) faces to the point that they are almost entirely dissolved away. Only relict features were left for the fine black shale particles to be deposited on. Note the diameter is also outlined by the shale particles. Look at the vertical picture of this type of phantom (above left) and you will see that these crystals well illustrate that quartz grows predominantly in the C axis direction! A not-so-common type of phantom came from one mine in Saline County. Pale milky quartz crystals grew and then were coated with clear rock crystal. They look like white clouds encased in clear crystal. This site was unusual because of the occurrence of many minerals, all included in the quartz. Ankerite, siderite, cookeite, and even galena, all as inclusions, have been reported from this mine. Phantoms are relatively scarce overall in the Arkansas deposits, but at some locations certain veins or pockets may be prolific in production. The most notable mines where phantoms occur are located in the Crystal Mountains in the Mount Ida region (Montgomery County) and at some locations in the Stanley Shale in Saline, Garland, and even Polk Counties. At least two locations were named for their phantom crystal -- Blue Phantom mine (Wegner) and White Cloud mine (now called the Green contract, being named after the family that controls it). Also, smoky quartz with distinct phantoms is sometimes recovered from brookite-quartz deposits in the Arkansas Novaculite adjacent to the Magnet Cove intrusion in Hot Spring County. Two additional mines have yielded some remarkable phantoms. The Willis mine in Saline County is known to have produced the largest and some of the best chlorite-phantomed crystal in Arkansas. In the late 1980s, a few pockets of rock crystal to 15 inches in length and 8 inches in diameter that contained multiple zones of green phantoms were discovered. Some 50 to 60 specimens were retained by the mine owner and later were sold to a pair of local collectors for $10,000 when the owner decided to go out of the business. I traded for one $500 crystal (priced by the new owners) and saw that they had two of the crystals priced at $10,000 each. Definitely over-priced, but probably worth $2,500 each in Tucson! A few of these crystals have shown up at other dealers as the present owners have come back to reality as they need the money. 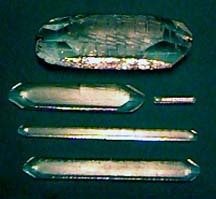 The specimens from the Willis mine are distinctive, due to both their size and the distribution of chlorite in the crystals. 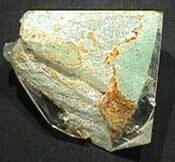 The chlorite is distributed in one portion of the crystal, being deposited on the lee side of the moving fluids. I examined the crystal pictured to the left (the one I traded for) with my microscope and counted over 500 layers of chlorite in this one specimen! Don Burrow's Collier Creek mine produced many interesting types of quartz. While at his Mount Ida shop in the early 1990s he showed me some newly discovered phantom crystals that he had just dug and cleaned. They were the blackest cloud-type inclusions of shale I had ever seen. I purchased several at that time for my collection. These black phantoms are much darker than the Wegner's blue phantom crystal, which looks medium gray in comparison. In comparison to the more typical rock crystal that has been produced by the operators of the Collier Creek mine, these specimens are scarce. Note the single double-terminated black phantom crystal, only about 3/4ths of an inch in length. As my son would say, really sweet! Especially since I got it from another dealer for only $5 cash! I still like it better than any of the other several 100 pounds of quartz specimens that dealer had on display that day. 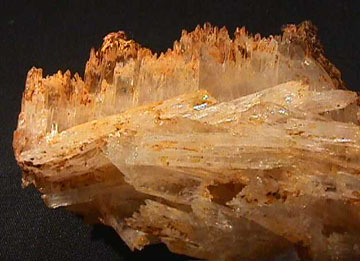 Quartz scepters are rare in the deposits of the Ouachita Mountains. The scepter habit is thought to originate as a second phase of growth after the fluids have stopped flowing for awhile. It is not uncommon to have smoky or amethyst scepter-type growth on rock crystal original growth, showing that the fluids have changed dramatically. The new growth simply originates on the terminations of existing crystals. Japanese-twinned quartz specimens are known, but scarce, from Arkansas. Good quality specimens bring from a few $100 to several $1000 a piece. In the past few years, a notable number of Japanese twins have come from the Collier Creek mine and Fisher Mountain, both localities in Montgomery County, and even a few from the Old Coleman mine in Garland County. Inclusions of other minerals in rock crystal and smoky quartz are not particularly uncommon and are often highly attractive. They may be of two general types: early formed minerals that were captured by later formed quartz as it grew and minerals that were forming in or floating in the hydrothermal fluids that were deposited on the growing quartz crystal. Examples of the first type include rutile, actinolite, hedenbergite, some hematite, and tourmaline crystals that formed early and had rock crystal deposited on it, thereby encasing the early minerals. The latter type includes chlorite, cookeite, hematite, mica, pyrite, galena, adularia, and many others, that were deposited as the quartz was crystallizing. In some specific instances, such as asteriated quartz, rutile is thought to have been in solid solution in the quartz and, upon cooling, the rutile was forced out of the quartz structure, resulting in microscopic highly oriented needles. The light, playing off these oriented needles, presents a six-ray star typical of asterism. The various types of included crystals give rise to a variety of lapidary materials and uses. Major sources for these types of gem materials are located in Brazil and Africa. OH, THOSE RAINBOWS! I have seen many internally fractured quartz crystals during my collecting years, but it wasn't until just a few years ago that I heard someone making a fuss over "rainbow" quartz. At the time, I wondered what the hoopla was all about. It's just a quartz crystal with an internal fracture, either of natural origin or induced by the careless practice of removing the crystal too quickly from a hot acid bath, right? But since then I have had some interesting conversations with various collectors and learned some additional facts. Ken Silvy, who digs herkimer diamonds (double terminated quartz crystals) several months a year up in the Middletown, New York area, told me about how he has to handle the crystals when he takes them out of the ground. He keeps them in the cold clay and places them in a bucket of cool water in the shade. He says he has seen many first-time collectors ruin crystals by wiping off the clay and putting them in the sun to dry. POP! CRACKLE!! The crystals heat up rapidly on the outside while the inside is still cold. Thermal stress builds up until they fracture! They must warm up very slowly to prevent the thermal stress building to the point of overcoming the internal strength of the crystal. Some time later, Ron Coleman told me an interesting and somewhat sad story relating to a specimen from a tremendously large pocket of crystals he and his brother Jimmie dug near Jessieville in Garland County, Arkansas. Some of these crystals were 3 feet in length and 1 foot in diameter. One in particular was clear from the termination to over one-half its length! Within a minute after it was removed from the cold ground, a fracture appeared about a foot from the base. They quickly covered it with blankets, but it was too late. While they watched in amazement (and disappointment as they saw $ 's flying out the window! 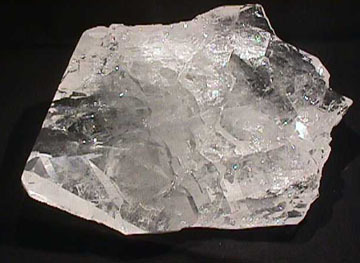 ), the fracture grew up the length of the crystal to within 6 inches of the termination. To prove his point, Ron took me over to Jimmies' backyard, pulled back some blankets and showed me the specimen! After these conversations, I became seriously interested in finding some specimens of "rainbow" quartz for further examination. Most crystals that I have seen that show rainbows were interesting but not all that attractive. But then, while on a trip visiting quartz mines, shops, and miners with my wife over the Labor Day 1999 weekend, I came across the one specimen exhibiting this feature that I knew I had to buy. It was at Sonny Stanley's shop on a table with many other specimens of natural light smoky quartz. Sonny told me he had recently purchased all this smoky quartz from Danny Rickard, who had recently dug it from a site near Paron, Arkansas. After careful examination, I discovered that most of the specimens were badly damaged during digging, but I managed to find 11 pounds of crystals that still had the terminations intact. I bought all that I thought were any good for $100. In this batch was the one special crystal I saw that displays a spectacular rainbow. See picture. The specimen weighs about one-half pound and has very little internal fracturing except for the one major fracture that is about one-half inch deep from one of the terminal major rhombohedral faces. The fracture parallels the rhombohedral face and forms an oval that measures about five-eighths inch by one-half inch. See picture. I took pictures of the rainbow area with my digital camera and when looking at the close-up picture of the reflecting fracture was struck that I had seen this color pattern before - many times. 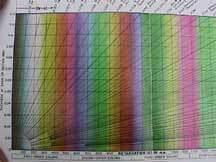 I got out my old college optical mineralogy book and opened it up to the Interference Color Chart. 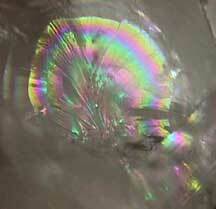 There it was - staring me right in the face - the explanation of the color patterns of the rainbow crystal. I thought for awhile, but could not remember reading a scientific explanation of this natural phenomenon. So I decided I must write it down. For years I had seen what happened when a single drop of oil landed on a wet concrete driveway or street. A rainbow of color appeared. I had recognized that this rainbow reflection of light was directly related to the thickness of the film of the oil floating on the water. I could see the orderly pattern of 1st order gray, then yellow, then orange, red, violet and blue starting from the thinnest edge of the oil film and progressing across thicker zones of the film. Then 2nd order colors appeared where the oil coating was thicker - blue-green, green, yellow, orange, red, blue. The pattern of colors was always the same, but the colors became more pastel with each rise of color order. I also have seen many examples of natural lightly iron-stained quartz that display iridescence on the iron coating. This is due to refraction of light through a very thin surface film of iron oxide. General color bands of electric yellow, blue, green, and red are sometimes seen, but are irregular, thus generally preventing a pattern developed from gradual thickening or thinning of the layer. Rarely, a mineral specimen will be seen that has a very uniform iridescent color, such as all electric blue, green, yellow, or red. I have seen some examples of this occurring on specimens of Arkansas goethite from Polk County. Some examples of rainbow films on goethite, listed as turgite in old mineralogical texts, are know from a site in Garland County, Arkansas. The same reflection explanation holds true for rainbow quartz, but the light interaction does not depend on this thickness of a coating of one substance on another, but instead it depends on the space between the walls of the fracture inside the crystal. The fracture contains a vacuum since it does not reach the crystal's surface at any point. In the photographed specimen, there are distinctive bands of 1st order colors on the outer band of the fracture and 2nd order colors into the center of the fracture. The center of the fracture, in this case, was the initiation point of the fracture during stress release. The fracture radiated out into the crystal in a planar direction until the stress was released, and the fracture died out before reaching the crystal's surface. I do not know what caused the specific location of the stress release point, but it could have been a tiny flaw, like an inclusion, in the specimen. The fracture developed on a rhombohedral crystal plane of the specimen. This plane is a known cleavage direction in quartz, but not often seen. The difference in colors across the fracture is caused by the thickness of the gap between the fracture walls. From looking at the Interference Color Chart, it appears that the widest portion of the gap (occupied by a vacuum in this case and located in the center of the oval rainbow) is a little greater than 0.12 mm, taking the birefringence of quartz as 0.009 from the chart. It runs out to 0.01 near the edge of the fracture before the fracture displays no color and where the fracture dies out. 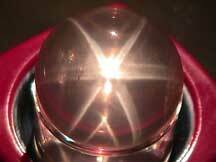 Maybe it looks magical, but a little knowledge of optics, optical mineralogy, physics, and optical phenomena are all that is necessary to explain this "mystical" property. By the way, this specimen is not for sale or trade since it is the best and most symmetrical display of a rainbow I have ever seen inside a quartz crystal! 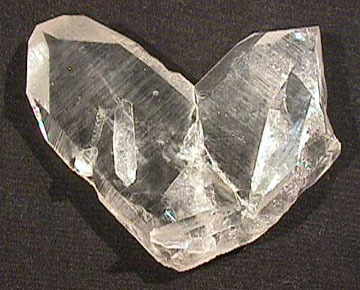 THE NATURE and general chemistry of hydrothermal vein quartz is well enough known to allow man to mimic the processes. This was first done in the research laboratory, and since the middle 1950's, by industry. Large stainless steel tubes or as they are called "pressure bombs" are partially filled with a high purity quartz termed lasca. Lasca is the chemical feedstock and the source of silica in the artificial system. Then water is added. Suspended in the upper half of the vertical bomb are wafers of quartz called seed crystals. A cap is screwed on and the bomb suspended vertically. The lower one-half being inserted into an industrial furnace. The heated fluid dissolves the lasca, rises by convection, cools and deposits the dissolved silica on the seed wafers, and then is displaced by more heated silica-saturated fluid. Crystal growth is monitored by passing x-rays through the upper portion of the pressure bomb and examining the size of the growing crystals. Growth must be uniform and constant so the temperature of the furnace and room are critically controlled. At the end of a typical run of two weeks, the bomb is allowed to slowly cool and then opened and the finished crystals are removed. The top example in the photo below is about seven inches long. The following information is furnished by Ted Lind, an engineer with Motorola, who has several years experience in the commercial growth of quartz. My thanks to Ted for furnishing this write up. I have made no changes to either his or my own article, so the reader can discover that sometimes even I need help! I read the article you wrote for Rockhounding Arkansas concerning the growth of synthetic quartz. Since this is a subject I know a little about, I thought I would provide some information on how these crystals are grown commercially. The vessels are usually not stainless steel. They are an iron alloy that is specially treated when made. I don't remember the designation of the alloy, but could find out if you are interested. There is an interesting step in the fabrication of the vessels that is a result of the operating pressures used. Autoclaves have operating pressures between 10,000 psi and 40,000 psi, depending upon the chemistry of the process used. Because of these high pressures, the material used is heat and pressure treated to provide a very dense matrix. One step in the process (of manufacture) is to take the whole autoclave and put it into a bigger autoclave (vessel) where the temperature is raised to around 3500 decrees C. and the outer autoclave is pressurized with something like 60 atmospheres of argon. This step is done to force any voids, bubbles, or defects out of the structure. The wall of a small commercial autoclave would be around 3" thick. The cap to the autoclave resembles the breech plug of a naval cannon. There is usually a very special sealing arrangement required to withstand the high pressures developed in an operating autoclave. When the vessel is put into service, the manufacturer performs a 'conditioning' run which allows a crystalling coating to form on the inside of the vessel. This coating is stable and prevents interaction between the vessel and the chemical solution used in the vessel. We use Lascas from Arkansas. The material is milled to a uniform size, approximately 1" to 1.5" in diameter, cleaned, and etched. The solute used in the autoclave is only partly water. Either a sodium hydroxide or sodium carbonate solute is used. The quartz and the solute nearly fill the vessel when it is closed. This is one of the reasons the high pressures are developed since water is basically incompressible. While x-rays have been used in the laboratory, they are not generally used in a production operation. The growth process has to be well understood and is allowed to proceed under very controlled conditions. Often a computer is used to run the autoclave during the 30- to 120-day growth cycle. (Time is a function of the size of the stone being grown.) it is very possible to predict quite exactly the point at which the growth process needs to be terminated. Usually the grown stones will have less than 1/4 of an inch between them at the end of the cycle. convection flow and channels the convection flow into a desirable geometry. Around the autoclave and the heaters there is an exterior insulation package. This insulates the autoclave and helps isolate it from external temperature changes. There is usually an air space between the insulation package and the vessel. There are also vents at strategic places to allow the air flow to be controlled. Changing these vents and the power delivered to the heaters determine the thermodynamic condition of the autoclave. The main parameters that are monitored in the process is the temperature at various points on the vessel and the pressure of the vessel. These parameters are used to control the growth process. They have to vary during the process because at startup the majority of the quartz material is at the bottom of the autoclave. The top only contains the seed material. At the end of the process, most of the quartz in the bottom has dissolved and recrystallized on the stones in the upper growth zone. As you can imagine, moving this much material around greatly affects the hydrothermal flow conditions and the thermodynamic state of the vessel. For this reason, the control algorithms are designed to make continual changes during the process to compensate for these changing conditions. In laboratories, they use smaller autoclaves for experimental work. I suspect your description really describes a lab operation. A two week growth cycle would be very short for any commercial operation. Commercial autoclaves range from 10" in diameter x 10-15' long to 1 meter (> 3 ') and nearly 12 meters (over 32 ') high. Companies that grow quartz may have as few as 20 autoclaves to several hundred vessels. 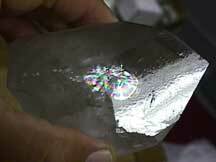 ToyoCom was growing gem-like quartz crystals over ten years ago. They add impurities to the growing solution to provide color to the quartz. I have a tie clip with a quartz gem that looks like a diamond with a very light blue tint. It is really quite nice. [My appreciation to Ted Lind, retired from Component Technology Laboratory, for his write up! Crystallography and "Handness" of Quartz Recently I had a question concerning how to tell right- from left-handed quartz. This article, although a somewhat lengthy answer, should give the reader an understanding of the problem and how, if you have the proper crystal faces expressed, to determine the "handness" of quartz crystals. To explain such a thing to a person not familiar with crystallography is understandably difficult, so I will endeavor to present a precursory explanation of the crystallography of quartz. If you will read the Hexagonal System article which my wife and I put together about Crystal Systems and Crystallography , then you will be ready to read the rest of this text. I will be referring to drawings in both the web article and in some books Way back in 1816, a naturalist/crystallographer by the name of Weiss discovered a property of crystal forms called enantiomorphism. This word is a mouth full, but pretty easy to understand. Hold your hands out in front of you, thumbs touching. (I assume you have all 8 fingers and 2 thumbs). Each hand is a mirror image or reflection of the other. Some crystal forms or shapes may exhibit this same property. But telling a right-handed one from a left-handed one requires some knowledge of crystal forms, thus our discussion will first have much to do with crystallography, before we look at how you determine if a quartz crystal is right- or left-handed. I will explain, however, why quartz is enantiomorphic. It has to do with the internal structure of the mineral. Quartz is composed of silica, SiO2, which occurs in the crystal structure as a tetrahedral form. Tetrahedrons are 4-sided closed geometric figures which are composed of equilateral triangles. You can think of it as a 3-sided pyramid sitting on the 4th side -- its base. All 4 sides are equal in area. Now, to grow a quartz crystal, these tetrahedra link together in chains which are parallel to the C axis, but the chains will have a rotational twist. They may either rotate clockwise along the length of the crystal or counterclockwise. The odds are 50-50 as to which direction they rotate. However, once they begin to form, the crystal's handness has been locked in. Mr. Weiss set forth some external form (morphological) conventions concerning determining whether a crystal is right- or left-handed. But to understand the names of the forms we must know something about crystallography. Since quartz is hexagonal/trigonal in form, I should start by defining the crystallographic axes for the hexagonal crystal system and inform the listener that all of the silica minerals we define as quartz crystallizes in the trigonal division of this system. You have to know something about trigonal symmetry. Look at the crystallographic axis drawing on the crystallography web site (fig. 6.1) and note the position of the C axis and the 3 a axes, both positive and negative ends. Next, note the drawing of a hexagonal prism, the 6-sided open form which is parallel to the C crystallographic axis. 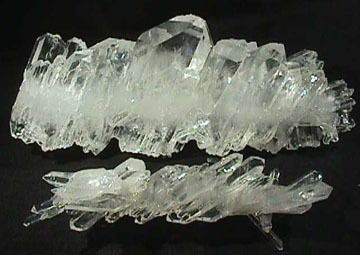 In relatively undistorted, prismatic quartz crystals, this form is exhibited along the length of the crystal. When viewed down the end (parallel) to the C axis, these sides form the edges of the hexagon you see around the outside of the crystal. These faces are designated as m in any crystal drawing. There is a drawing of the prism form in the web article, but it also has an end termination, which in the drawing is noted as the c pinacoid face. You can leave this face off your drawing, so you can visualize that the prism form is open at the ends (see drawing on right. Now that we have a hexagonal open-ended shape, we must define the forms of quartz that compose the termination. If you look at many quartz crystals, you will find that usually there is a set of 3 dominant (larger) faces that alternate with 3 subordinant (smaller) faces on the termination. We will not deal with distorted crystals, only "chalkboard-type ideally formed" quartz crystals. We have to discuss several forms in the trigonal division. The most simple form to recognize is the positive rhombohedron. It usually forms the dominant set of 3 faces on a terminated quartz crystal. By dominant, I mean that the faces of the positive rhombohedron are larger than the other set of 3 faces. This form is also considered, by convention, to be positive in relation to the 3 a crystallographic axes. 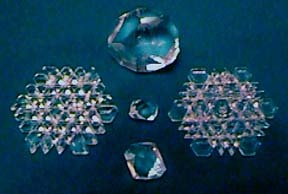 The positive rhombohedron faces are designated as r in crystal drawings. The subordinate form on the termination is the negative rhombohedron and is designated as z in drawings. It is easy to confuse which set is the positive rhombohedron, but usually, aside from being larger, the positive rhombohedron presents a higher reflection of light from the surface than does the negative form. Figure 2 on page 10 of Volume III of Frondel's Dana's System of Mineralogy is an excellent drawing to show the relationship of the positive and negative rhombohedral faces to the a crystallographic directions. It's simple, but effective. The next form to consider is the trigonal trapezohedron, more specifically the positive right trigonal trapezohedron, which is labeled x on crystal drawings of quartz. This face is not often expressed. When present, it is seen at the junction of 2 prism faces m and the positive rhombohedron r and it displays a trapezohedral planar shape. It is usually bright lustered. The trigonal pyramid, the last form to discuss, is designated as s and is at the junction of the positive rhombohedron r and the prism m which is in line vertically with the negative rhombohedron z. It typically forms an elongated rhombus-shaped face. It is rarely present. Drawings of these forms are present in many editions of Dana's Textbook of Mineralogy. Now, we are finally ready to talk about determining if a quartz crystal is right- or left-handed! Before you can orient a crystal to determine it's handness with certainty, you must have the forms present that we have just discussed. If the trigonal pyramid s is not present, but the trigonal trapezohedron x is, then we are making an educated guess. Without either two forms present, we cannot tell "handness" by using external form. You start by finding a quartz crystal that has both the pyramid and the trapezohedron present. You will observe them as "unusual extra faces" on your specimen. That is the hard part because most crystals do not display these forms. However, we will assume you have one in your hand. Look at the termination and decide which alternating set of 3 faces is both the largest (dominant) and has the highest luster. This is where we can get into quite a discussion if the specimen's termination exhibits almost equal-size sets of rhombohedral faces! But you must make this determination. When you have, then the set of dominant faces becomes the positive rhombohedron r by convention. Also, the subordinant set must be the negative rhombohedron z. Now, hold the crystal where the termination is pointing up (vertical) and rotate it around horizontally in your hand until the positive rhombohedron r faces you. Are the small faces of the trigonal trapezohedron x and the trigonal pyramid s on the right lower corner of the positive rhombohedron r ? If so, then the crystal is a right-handed crystal by convention (by definition). If these 2 faces are on the lower left of the positive rhombohedron r, then the crystal is a left-handed crystal by definition. Reread these two statements while looking at the drawings below. It's that simple. Not so simple to get to this point, but simple once you are here! Now, as a matter of interest, I must say that all quartz crystals are either right- or left-handed whether we can determine it from their crystal form or not. There are optical and etching methods that confirm this assumption. So, if you don't have the necessary faces present to make an accurate determination, then you can only flip a coin because you have a 50-50 chance of being correct (or wrong) by guessing! Very rarely, you may find a quartz crystal that has the x and s faces on both lower right and lower left edges of the positive rhombohedron r ! If you do, you have a very rare specimen. I have one example for 40 years of collecting and have to admit it was given to me by a fellow collector because I kept raving about how fantastic it was. He just saw that the crystal had a ding on the termination and so it was of no "real value" to him! It is a Brazil twin which is the intergrowth of both a right- and left-hand quartz structure in what appears to be a single crystal. Such twinned quartz crystals are not particularly rare, but to have both sets of x and s faces expressed make the combination of their presence with the twinning most unusual!